Interesting wine fact; California produces about 30% more wine than all of Australia. 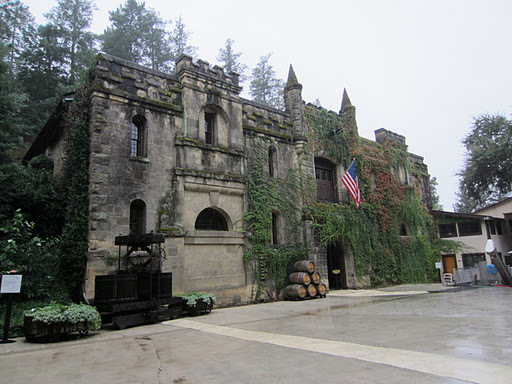 The Napa Valley is without doubt the most famous region in California. However, less than 5% of California’s production comes from the Napa and Sonoma Valleys. And yet the Napa Valley is the second most visited place in California, after Disneyland, which shows how important wine tourism is here. As previously mentioned I began contacting wineries in California before I left Australia, and those I contacted in Napa were by the far the most responsive. It was nice to have a few more appointments to fall back on, but as I was relatively unfamiliar with most wine from the Napa I didn’t know what to expect. Driving up the 29 Highway towards my first appointment you realise how important the wine business is here, with extensive and dense plantings constantly and a winery every 100m or so. No wonder they call this the Vegas of wine! 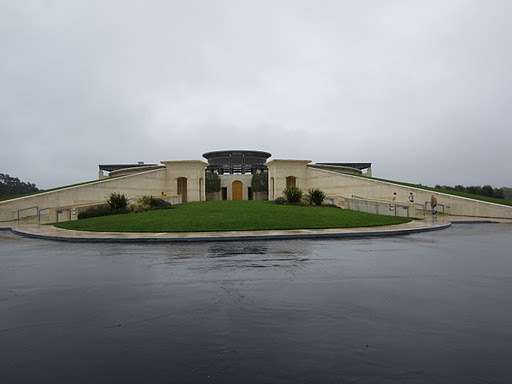 My first visit in the Napa Valley was to Opus One, which was a joint venture between Mr. Napa Robert Mondavi, and the Rothschild family of Bordeaux. Robert Mondavi made wine in the Napa from the 1960s and basically introduced quality into the region, and was an advisor and mentor to many. The partnership was to create an iconic Bordeaux blended wine, and to this end they built a winery for this very purpose. The architecture is some of the most striking and unique in the valley, the limestone used was brought in from Texas. In the winery no expense has been spared, and reminded me of the kind of investment that had been made at Chateau Latour when I visited last year. They have the finest barrels, a sorting table with at least 10 sorters working, and a laser-sighted fruit sorter which precisely measures the size shape and colour of berries. Opus One is a cabernet sauvignon led blend of the classic Bordeaux varieties, which sees at least two years in new oak barrels. Whilst the flavours are extremely opulent and full, the new oak tends to dominate on the palate (understandably). The wine is clearly designed like a Bordeaux First Growth, to be cellared for at least 10 years before integration and approachability. It is a pretty amazing wine, and relatively good value at $200+ per bottle, but personally I prefer wines that can be drunk on release and deserve to be cellared, not required to be. Fearing that I would continue to suffer these problems I again popped my head into Quintessa, another purpose-built facility for one wine, not unlike Opus One. Fortunately the staff were a lot more receptive, and luckily I was able to tack onto another trade visit that was going on. 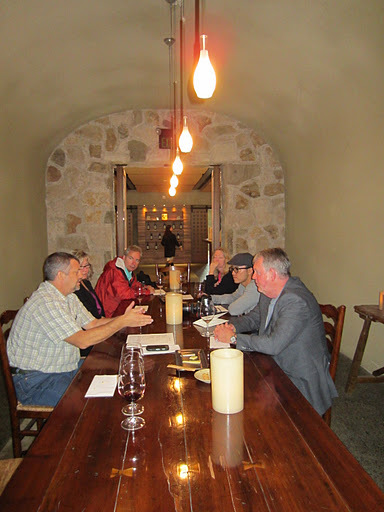 I whisked through the winery (they all look pretty similar, hate to break it to you), and then looked at a vertical tasting of the Quintessa across four vintages. The Quintessa is a more velvety and soft style without compromising on structure and tannins, and interestingly uses carmenere, a traditional Bordeaux grape that is now almost exclusive to Chile. Of the four vintages all the other guests loved the 2007 as it was a classic full-bodied and rich Napa style, but I was quite partial to the 2006 and the 2004 was still showing very young. Frog’s Leap has a really interesting story, and I heartily recommend visiting. 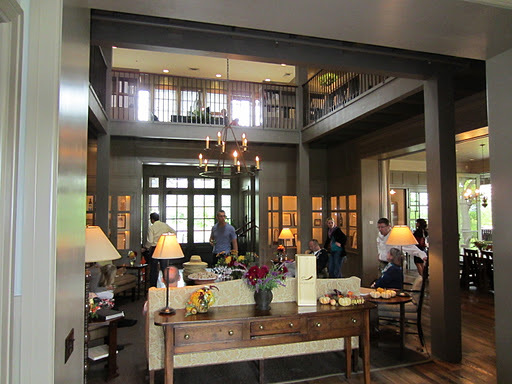 The cellar door is actually more like a two storey, traditional American country house. The bottom floor has separate rooms that are all open and free-flowing. The second floor has all the administration offices, and has an opening to the first floor so there is great use of natural light. The winery buildings look like huge barns, there are beautiful natural and native gardens, and they offer a lovely tour of the property with wine tasting. The Frog’s Leap vineyards are all totally organic dry-farmed, and they also utilise some biodynamic practices. According to Frog’s Leap this allows the fruit and therefore wines to better express the terroir of the site. I would have to agree that the wines were very unique from a lot of the wines I tasted in the Napa, and therefore it makes sense. The Sauvignon Blanc was the first wine they produced back in the early 80s, and is very good. I was quite impressed with their Merlot, as it looked more like a full-bodied pinot noir, very restrained and light. 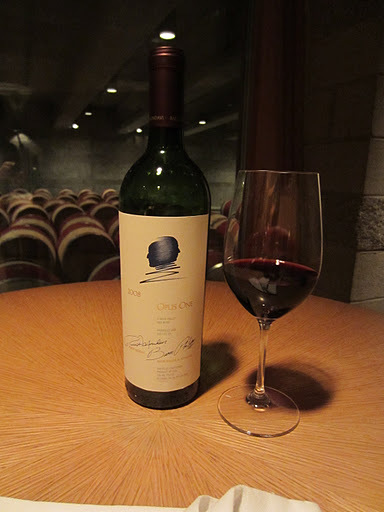 The Syrah was also very good, and in general the wines are very well priced. 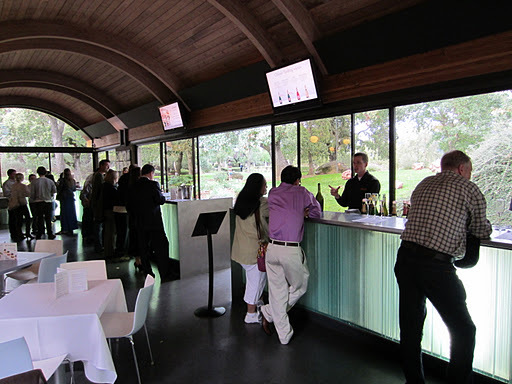 No visit to the Napa would be complete without visiting Chandon, if only to see how different it is to Chandon Australia. It is a much larger facility, and the visitor centre is definitely equipped to handle the number of visitors the region gets. There is a Michelin-starred restaurant named Etoile, which would unfortunately be well out of my budget. They have tours and events, it’s very well equipped. The wines are designed for the US palate which calls for more fruit and less acid, and they succeed in making good wines in this style. It is a shame I didn’t get a better chance to look around, but my appointment confirmation seemed to have gone missing. No matter, still got to see it. 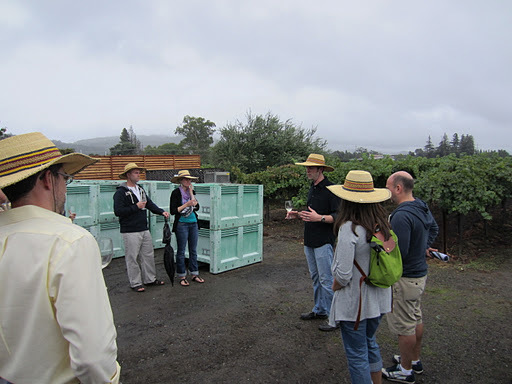 Click here to see more photos from Day One in the Napa Valley, California.